Jewelry Costume Contemporary Unsigned Misc. 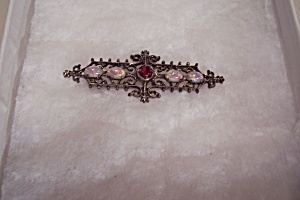 Stunning vintage brooch/pin with an antiqued filigree backing with four prong mounted fire opals and one faceted red stone in the center. Signed on the back but so small that it cannot be read with a loop. 2-1/8" wide. Fine condition. 1900-1920.